A good knowledge of correct service and installation techniques will enhance plant operation and reliability. The Combined Service and installation course is aimed at technicians in the refrigeration industry to improve and update service and installation skills, coupled with an understanding of the principles of refrigeration. 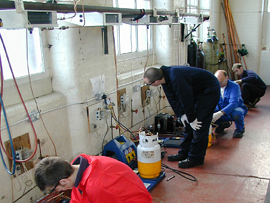 The course also covers the practical skills and knowledge necessary for the City and Guilds 2079 (Category 1) and the City and Guilds 6187-21 Copper Brazing qualifications. Basic mechanical skills are assumed for this course. Although shown as 12 days, actual training only takes place on weekdays and the weekend in the middle is excluded. To attain a basic understanding of the principles of refrigeration and to learn service, installation and commissioning skills including the skills and knowledge necessary to attain Pipework and Brazing and an 'F Gas' Category 1 Refrigerant Handling qualification. The topics will be covered with emphasis on practical work from the delegate. Basic theory will be demonstrated using a visual refrigeration unit. Theoretical work will be assisted by the use of good quality visual aids and discussion session.